This pattern is available from planetjune.com for $3.00. Please note this is NOT a complete pattern: this is an EXPANSION PACK for my Sloth (three-toed) pattern. 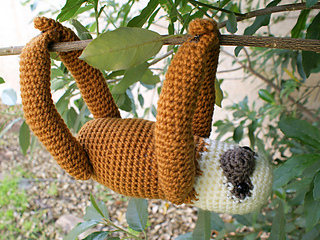 It includes all the modifications required to crochet a Two-Toed Sloth. Yarn: worsted weight yarn: less than one skein of tan/light brown (approx 120m), and small amounts of cream/beige and medium/dark brown. 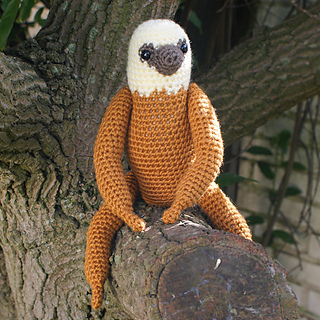 My two-toed sloth has a pale head with a darker face and nostrils crocheted into the muzzle. His long legs have crocheted-in knee shaping so they don’t just look like tubes. His shoulders and hips are jointed (I’ve also provided instructions for a non-jointed version) and he can hang around like a real sloth thanks to almost invisible hook-and-eye fasteners on his feet (optional, and I’ve also suggested alternative fasteners). Note: You could brush your sloth to give him a shaggier look that would be even more realistic, but I opted to leave mine with clean lines so you can see him more clearly. 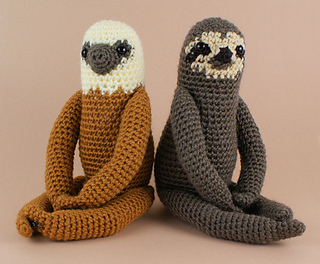 The last 2 photos of this listing show both sloths together. 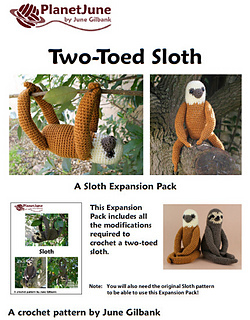 You can buy the Three-Toed Sloth pattern together with this expansion pack at a reduced price here. 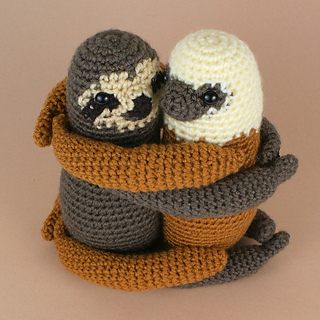 Or if you already have the original Sloth pattern, the pattern link on this page will let you buy just the Two-Toed Sloth Expansion Pack. What is an Expansion Pack? An Expansion Pack is an add-on to an existing PlanetJune pattern. The Expansion Pack lets you modify or add to the original pattern to create something else. You cannot use the Expansion Pack alone - you must also purchase the original pattern in order to be able to complete the pictured items in the Expansion Pack pattern. Please join us in the PlanetJune crochet designs group - you can get pattern support, join crochet-alongs, show off your FOs, suggest new designs, and chat. All welcome!